We've read a lot of great books this Summer-- new and future releases as well as backlisted treasures! 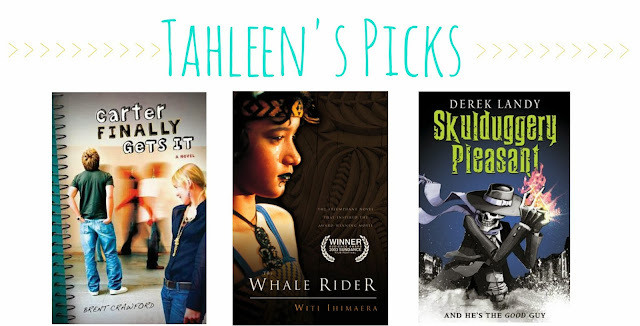 We took to the task of each listing 1-3 favorite books we've read during Summer 2013 (June 21 through the first day of Fall!) Farewell Summer 2013, you've been great all around! Two Boys Kissing by David Levithan: This book was amazing. This is why he is a favorite of mine. Forgive Me, Leonard Peacock by Matthew Quick: This was an unexpected book for me this summer but it was very memorable and super powerful. Shadow & Bone by Leigh Bardugo: I'm so late to the game on this series but I THINK I MAY SECRETLY LOVE FANTASY NOVELS!! Excited for this series and excited to delve more into the fantasy scene! Just One Year by Gayle Forman: Everything I could have hoped for and more! Carter Finally Gets It by Brent Crawford. I think part of the reason I enjoyed this one so much was because I listened to the audio version narrated by Nick Podehl. Now I understand why everyone loves him as a narrator. This book has it's gross moments, but it was just too funny. The Whale Rider by Witi Ihimaera. Just a lovely story, especially to listen to. I don't know much about the Maori people, and this was a nice glimpse into their modern (well, 30 years ago) world and culture. Ihimaera is an excellent storyteller and writer. Skulduggery Pleasant by Derek Landy. It's been a banner summer for audiobooks. This one was a great fantasy adventure full of danger and magic, and a lot of (sometimes dark) humor. 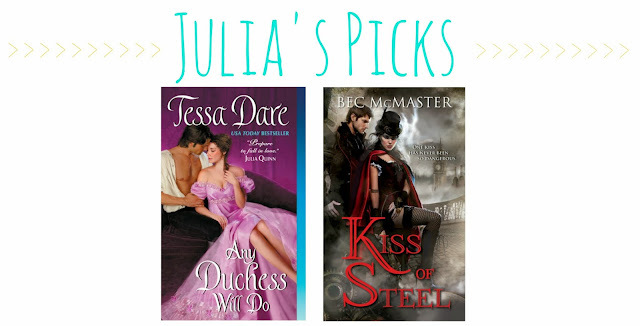 Kiss of Steel by Bec McMaster: Yay, steampunk! This was an awesome mix of steampunk, paranormal, romance and great writing. I had some problems with the ending, but that isn't dampening me for the rest of the series! 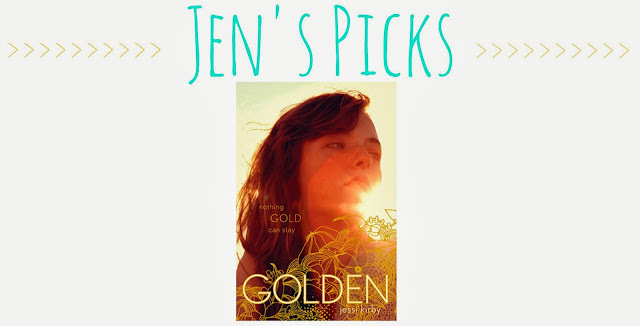 Golden by Jessi Kirby: I loved this book so much because it was about pushing your limits and getting out of your comfort zone. Favorite reading highlight of the summer? I READ AND FINISHED THE HARRY POTTER SERIES. Renegade by J.A. Souders: This was an amazingly glorious book about a group of people who live in a self-contained glass facility under the ocean. Their leader, Mother, has a little too much control... and a surface dweller who arrived by accident is all of a sudden very determined to undermine her authority. There's love, action, and pretty scenery! Loved it! 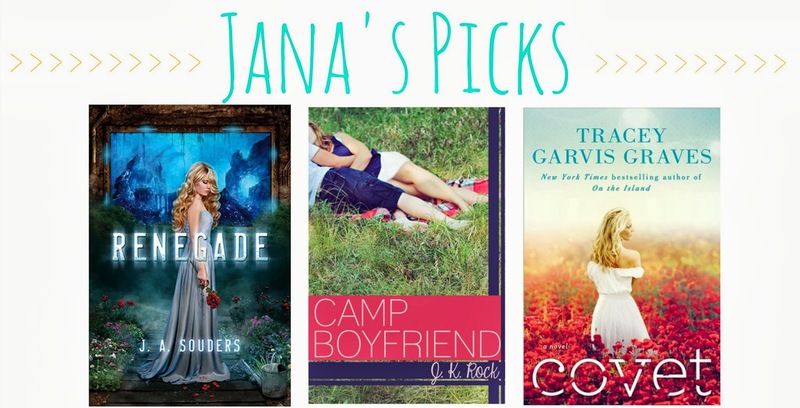 Camp Boyfriend by J.K. Rock: Loved this summery love story at camp! SO cute and so fun! Covet by Tracey Garvis Graves: I love Tracey's ability to tackle tough subjects. She's an amazing writer, and I could not have asked for a better book from her. Siege and Storm by Leigh Bardugo: I SO LOVED THIS BOOK!! I had to text Kelly while I was reading this because I just had ALL THE FEELINGS! So Jamie: hurry up and read this :) I'm so excited to see Shadow and Bone there! 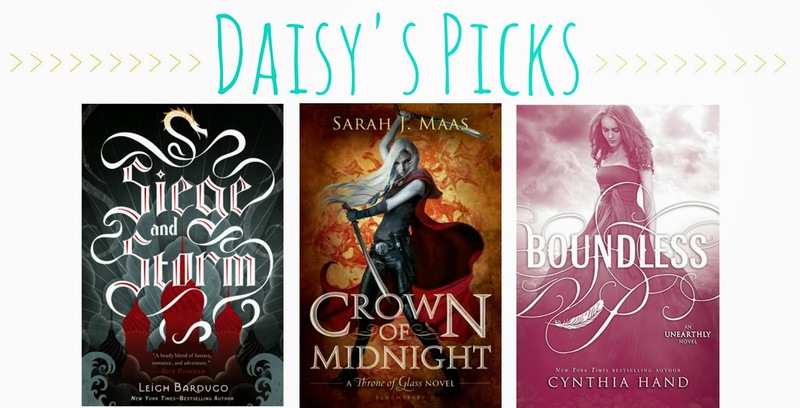 Crown of Midnight by Sarah J. Maas: SO much love for this series!! I adored this book and it may even have been better than Throne of Glass! Boundless by Cynthia Hand: ALL THE TUCKER FEELINGS! I was so scared to read this last instalment in the series, but it was amazing and heartwrenching and just everything I could have wanted and SO WORTH IT! 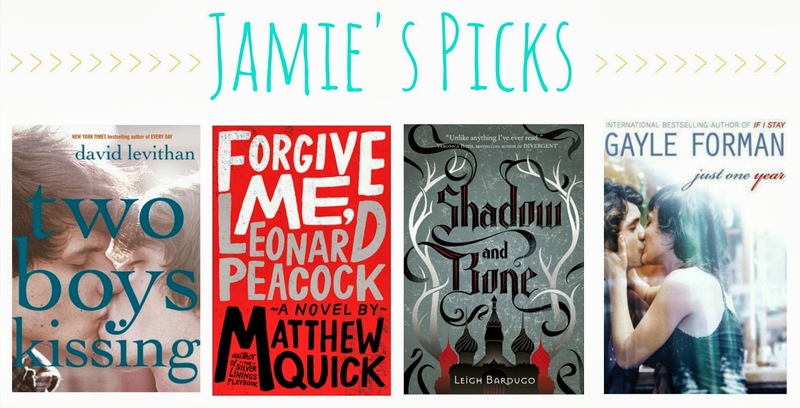 And honorable mentions: The Viscount Who Loved Me by Julia Quinn and Tarnish by Katherine Longshore! Have you read any of these? What were YOUR favorite reads from this summer?? I have a bunch of these on my to read list. Hands down my favorite book of the summer was Songs of Willow Frost by Jamie Ford. Forgive Me, Leonard Peacock is on my list of must-read. I'm glad it's on your list of favourites.